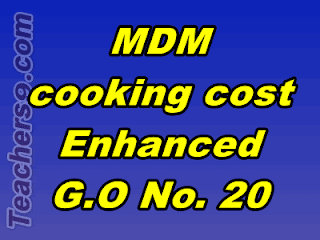 MDM New Rates from 1.4.2018 MDM Rates Enhanced G.O.No. 20 Dated: 18-01-2019. G.O.No. 20 Dated: 18-01-2019. School Education Department – Mid Day Meal Scheme – Enhancement of cooking cost of Primary and Upper Primary and High Schools under Mid Day Meal Scheme – Orders – Issued. Updated another G.O.RT.No.71 Dated: 05-03-2019 also. Primary: Enhanced New Mid Day Meals MDM Rate for Primary is Rs. 4.35 From 1.4.2018. Upper Primary: Enhanced New Mid Day Meals MDM Rate for Upper Primary is Rs. 6.51 From 1.4.2018. Enhanced New Mid Day Meals MDM Rate for High School is Rs. 6.51 From 1.4.2018.